Dec 10, 2010 The deadline for the paper submission has been extended to Dec 22 (Wed). Sep 30, 2010 Acceptance notification was sent to the authors. Aug 31, 2010 The deadline for the abstract submission has been extended to Sep 7 (Tue). Aug 1, 2010 Abstract submission is opened. The International Toki Conference (ITC) has been successively held reaching the 20th event this year. 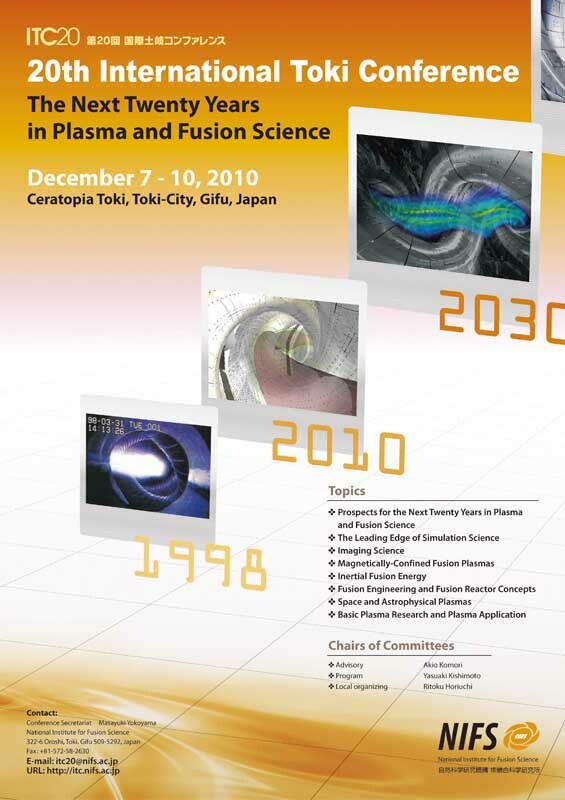 On this occasion, the 20th ITC will focus on the prospects for the next twenty years of plasma and fusion science, by reflecting on the progress achieved within the past years. 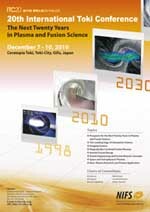 The frontiers of simulation science in plasma and fusion research will be the main topic. At the same time, the academic systemization of plasma and fusion science should manifest itself in the 20th ITC, through the synergism of the diversity of research area, and progress of the leading edge. December 7 (Tue.) – 10 (Fri.), 2010. English is the working language of the conference. Those who plan to attend the conference must inform us of following items by e-mail to by October 31. Title : Prof. / Dr. / Mr. / Ms. It is not necessary to register again for the authors who submitted an abstract and received its acceptance from the program committee. The registration fee is 20,000 yen, and the fee for students is 15,000 yen (both including the banquet fee, which cannot be subtracted). Banquet ticket for an accompanied person is 5,000 yen. The registration fee is payable at the conference site (only by cash in Japanese yen). Information and rates for various hotels at Toki and Tajimi cities are listed here. Specific information such as a directions can be obtained by clicking the link for each hotel. *Note that the transportation between the hotels and conference site will be the responsibility of the participants. In case you need a visa to enter Japan, required official documents will be provided through the local organizing committee after acceptance of your abstract, upon request. The LOC has organized two tours for participants. These tours will depart from the conference site on 9 Dec. (Thu.) afternoon just after the morning session (1:00 pm) and will come back to the conference site before the banquet. 2000 JPY per person is necessary for the lunch box and ticket. Magome is an old station on the Kiso-kaido (Nakasen-do). The delightful main street, which is closed to traffic, contains a variety of wooden and plaster Edo-style inns, houses, temples and shrines, with the surrounding, forested mountains as a spectacular back-drop. We introduce you the Large Helical Device (LHD) and other facilities at NIFS. Copyright ©2010 ITC-20 LOC. All rights reserved.